Israel’s Sea of Galilee and Dead Sea are dying – What is being done? ISRAEL – The Dead Sea is dying. So is Israel’s Sea of Galilee – the country’s only surface-level source of freshwater. The effort to save these sacred and historic lakes involves a convoluted mix of religious tradition, tourism and technology. Over the past several decades of carving out an oasis from the desert, Israel has pushed back countrywide water scarcity through desalination, conservation, efficient use of the country’s limited freshwater, and wastewater treatment and reuse. Today, approximately 80 percent of Israel’s drinking water comes from desalination plants, meaning that even as Israel enters its sixth consecutive year of drought, the country should continue to have a stable supply of drinking water for its residents. The main concern surrounding the drought is the health of Israel’s two natural, above-ground bodies of water, the freshwater Sea of Galilee and the saltwater Dead Sea – both sacred to residents, if for entirely different reasons. While the Dead Sea is valued particularly because of its contributions to Israeli tourism, the Sea of Galilee holds special import in religious history and because many residents remember when it was the country’s main source of water. The ongoing drought has reduced the Sea of Galilee to some of its lowest levels in history, 215.5 meters (about 707 feet) below sea level. To try to assuage the rapidly decreasing levels and prevent any irreparable environmental damage, Israel has almost completely ceased pumping from the Sea of Galilee. But some pumping is necessary to keep the machines working and to fulfill Israel’s peace agreement with neighboring Jordan. Some of the streams which feed into the Sea of Galilee flow from Jordan, meaning that a portion of the water that ends in the Sea of Galilee should belong to the Jordanians – the crux of the peace agreement. While Israel once faced attacks from Jordan, as evidenced in the historic Yom Kippur War, having water be part of the peace agreement has ensured cooperation between the two countries, Eshel said. Though Israel has considered building a pipeline from the seawater desalination plants to Jordan to fulfill this water requirement without having to pump from the already-low Sea of Galilee, Eshel said that the construction for such a project would be too cost-prohibitive to be feasible. Today, only 5 percent of Israel’s drinking water comes from the Sea of Galilee, amounting to approximately 25 million cubic meters (abut 6.6 billion gallons). That is just enough to keep the machines working, Eshel said. The biggest culprit to the sea’s decline is evaporation, and without adequate rainfall, the sea has no chance to replenish what it is losing. “Every year, we [lose] something around 240 million cubic meters (about 63.4 billion gallons) to evaporation,” Eshel said, which appears as about one meter each year in depth. This descent can be seen from the shoreline, which now contains meters of sand where there used to be water. “When I was a child, every day I need to choose whether I’m going to school or going to swim. Most of the time I’m going to swim. Don’t judge me – there was no air conditioning when I was a child,” Eshel said. He grew up along the Sea of Galilee and held up a picture of the coastline by his home – a long stretch of concrete sidewalk that ended at the water’s edge. In the photo, water lapped against the wall about a foot below walking level, and small boats floated only a meter or two away from shore. “I never even needed to think if we have the ability to jump or not,” Eshel said. He held up a second picture – that same stretch of coastline outside his childhood home taken in recent years. The water’s edge had receded 15 to 20 feet, leaving only sand near the concrete sidewalk where Eshel used to jump off, and old boats were beached on the sandy bank where they used to float. An idea has been proposed to build a pipe sometime in the next three years that would funnel desalinated water into the Sea of Galilee, Eshel said. This would be intended to provide water to the settlements around the Sea of Galilee and to help combat the effects of the drought on the lake, but some Israelis are hesitant to support such a project because of the “one good winter” concept, he said. A similar debate surrounds the Dead Sea, which is too salty to be used for drinking water, but is a big part of Israel’s tourism industry. 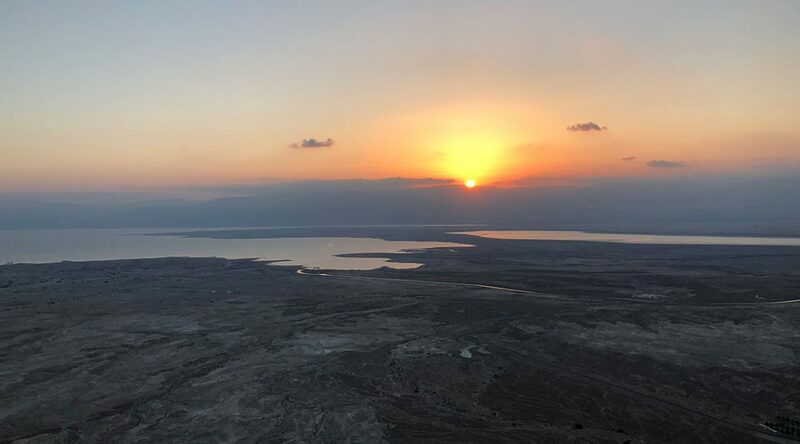 That 1.15-meter, or approximately 4-foot, vertical decline means the Dead Sea’s coastline has shrunk several meters inward depending on the location along the coast, Weisbrod said. Even with the drought, what Weisbrod called the “Dead Sea works” – the factories that process and sell water, salt and mud from the Dead Sea – are still drawing water. The solution, which has already received preliminary funding from the World Bank, has been called the Red Sea-Dead Sea project and will involve Israel and Jordan working together to pipe water from the Red Sea, in Jordan, to the Dead Sea, which is on the border between both countries. Adding water to the Dead Sea would be beneficial to both countries, as well as hopefully help stop the formation of sinkholes along the coastline. But the project is facing even more pressure from Jordan than from Israel, Weisbrod said. This is because the plan involves building a desalination plant at the saline Red Sea, desalinating the water, and sending the fresh water to Jordan and southern parts of Israel. The twice-as-concentrated brine, the output from saltwater desalination, will then be piped to the already-saline Dead Sea. While it seems like a beneficial plan on most counts, significant environmental concerns must be addressed, Weisbrod said. Scientists are not sure how the water from the two seas will react, but their high concentrations of calcium and sulfate could combine to create gypsum, which would float on the surface of the Dead Sea. Another problem is that the pipeline will likely run along the rift valley in Jordan, an area that is prone to earthquakes. Funding has been secured, according to Dubowski, but not without heavy debate. Some parties wanted Israel to bring water from the Mediterranean Sea to the Jordan River in the north, and let the Dead Sea be replenished more naturally, Dubowski said, which would also remove the political aspect of the problem. Photo at top: The Dead Sea, at more than 400 meters (about 1,300 feet) below sea level, is the lowest point on earth. The body of water, which serves as one of Israel’s main tourist attractions, is shrinking due to drought, evaporation and continual pumping for industry.